Planning is underway to extend Amtrak’s Vermonter service north to Montréal in the next couple of years. As part of this project, new joint customs and immigration facility is to be built at Central Station in Montréal, Quebec for both the Canada Border Security Agency and U.S. Customs and Border Protection. 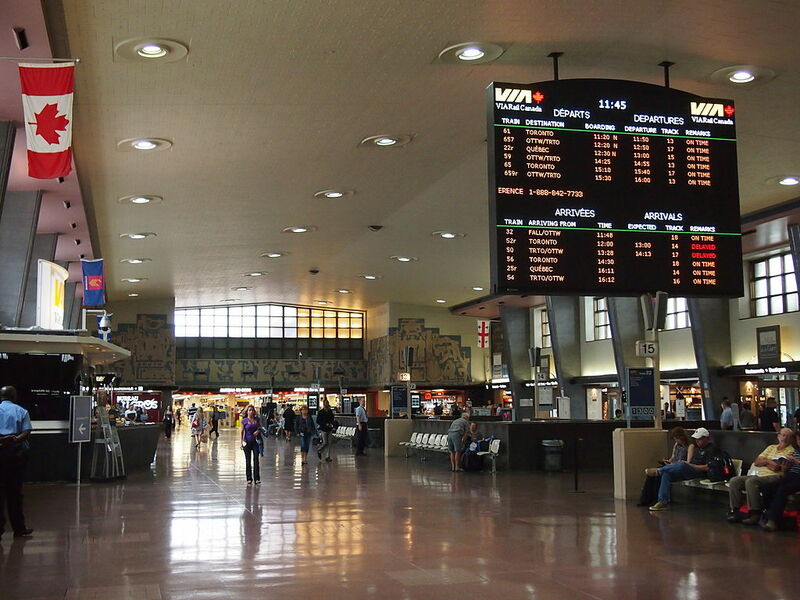 This facility would allow Amtrak passengers departing from Montréal on the Vermonter and Adirondack to clear U.S. customs and immigration processes prior to boarding the train – a process that is known as preclearance. In the reverse direction, passengers on these two trains would clear Canadian customs and immigration upon arrival in Montréal. This setup would be similar to the way that passengers on flights to/from the United States are processed at airports in Canada today. Additionally, operating agreements must be established by the railroads involved and the various parties must agree on whom will pay the costs associated with extending the Vermonter to Montréal. The good news is that all of the parties appear to be in near unanimous agreement to support this project and it is moving forward. 2012-2014 | The 18.8 mile stretch of railroad track between St. Albans, Vt. and the U.S.-Canadian border was upgraded to allow future passenger trains on this stretch of track to operate at a maximum speed of 59 miles per hour. March 16, 2015 | The United States and Canada signed the “Agreement on Land, Rail, Marine, and Air Transport Preclearance Between the Government of the United States of America and the Government of Canada.” The agreement, among other things, allows for the establishment of a preclearance facility in Central Station. June 17, 2016 | Introduction and First Reading of the “Preclearance Act, 2016” in the House of Commons, in Canada. December 2016 | The U.S. Congress passed H.R. 6431, the “Promoting Travel, Commerce, and National Security Act of 2016”, which will help to facilitate the expansion of the U.S. Customs and Border Protection pre-clearance facilities in Canada. This bill was signed by President Obama on December 16, 2016. July 18, 2017 | Amtrak operated a special trip in conjunction with New England Central, CN and various government officials from the US and Canada, to inspect the route from St. Albans, Vermont to Montreal, Quebec. December 12, 2017 | The Canadian government passed into law Bill C-23, the “Preclearance Act, 2016″ which allows for the establishment of U.S. Customs and Border Protection preclearance facilities in Montreal Central Station. January 15, 2018 | Sen. Patrick Leahy (D-Vermont) said in an interview that he would expect Amtrak’s Vermonter service to be extended to Montréal by no later than 2020.